Helly Shah who was last seen in the Colors tv show Devanshi is now all set to rock Star Plus’s show Sufiyana Ishq where Helly will be seen opposite Rajveer Singh and recently we interacted with her about the same and here is what she had to say. 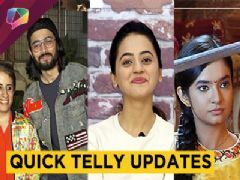 Now how excited are you guys for this upcoming show and Helly’s comeback, do Comment and tell us also don’t forget to subscribe to India Forums, Addiction at its best. User Comments on video titled "Helly Shah Talks About Her New Show Sufiyana Ishq | Star Plus"
Helly shah best wishes for your upcoming show..
Helly shah miss u so much dear ...so excited for your upcoming show sufiyana ishq..luv u so much! Helly shah..can't wait for your upcoming show..All the best! All the best helly..damn excited your upcoming show ..
Helly shah so so excited for your show sufiyana ishq..All the best!